Situated in Laleli, in the Ouarter of Mesih Pasa, this mosque is actually an old Byzantine monastary church. It is thought that this structure was built in the 10th century as the church of Mireteion Monastery that was founded by Romanos I Lekapenos who was the coemperor with Constantine VII Porphyrogennetos. 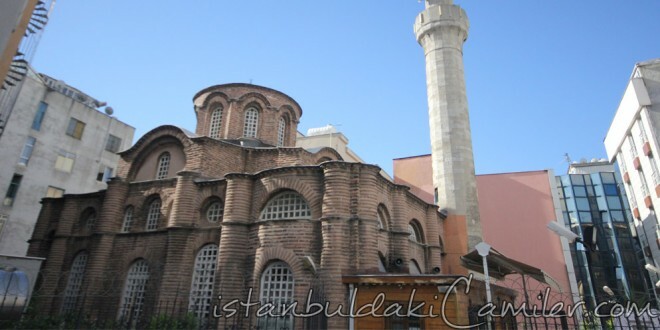 Since Mesih Pasha had it converted it from church into mosque, it is called with his name. The reason why it was also called as Bodrum (Cellar) Mosque is because of a cellar it has underneath. It was converted into a mosque shortly after the conquest during the sultanate of Sultan Bayezid II for the Grand Vizier Mesih Ali Pasha. Although the exact date of its conversion is not known, it is supposed to have been converted during 1500s. Many benevolent people donate to the waqf of the mosque for the recitation of the Qur’an. It was damaged in the fires that broke 1782 and 1911. English Archaeology Board made some researches in and around the mosque in 1930. C.L. Sriker cleaned the cellar underneath the mosque in 1965. R. Nauman, on the other hand, tried to find out the signs of the palace of Romanos with the excavations he had carried on. The mosque has a central dome and a single minaret with a single baleony made out of face stones. The structure is mainly made of stones and bricks. From place to place face stones are also used it its construction.